Using named day delivery: Order this product within 1 hr and 11 mins for guaranteed Friday delivery. 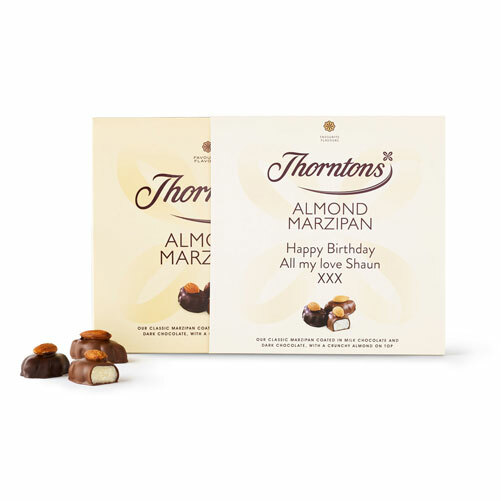 Soft, sweet marzipan is a classic treat, and Thorntons Almond Marzipan is coated in creamy milk and rich dark chocolate, then topped with a crunchy whole almond, to make it even better! 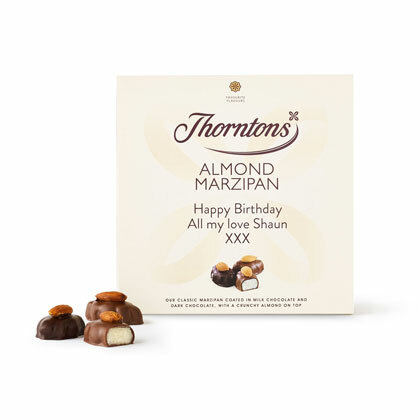 The new look Almond Marzipan box is smart enough to give as a gift to a marzipan fan, making the perfect way to say thank you or well done – or just because! Containing two bags of Almond Marzipan, this ballotin-style box is sure to make the day of anyone who loves marzipan. This Personalised Almond Marzipan Box comes complete with your very own message. If you want to make the gift of Thorntons that little bit sweeter, try adding a personalised message. Whether you want a name or a short message, we’re happy to help. Sugar, Almonds (17%), Cocoa Mass, Glucose Syrup, Cocoa Butter, Dried Whole Milk, Humectants (Sorbitol, Glycerol), Dextrose, Palm Kernel Oil, Milk Fat, Fat Reduced Cocoa Powder, Emulsifier (Soya Lecithin), Salt, Acidity Regulator (Acetic Acid), Flavourings.